On Lag Ba'omer 5775, the old SGO and the new SGO joined forces to create an amazing event for our student body. This event was a farewell from SGO 2015 and an introduction to all that's in store next year with SGO 2016. We had an obstacle course, blind folded musical chairs, cotton candy and popcorn and much more. We had students fill out cards to their friends and write down reasons why they love their friends because Lag Ba'omer is the day that Rabbi Akiva's students stopped dying because they started showing each other respect - ואהבת לרעך כמוך. 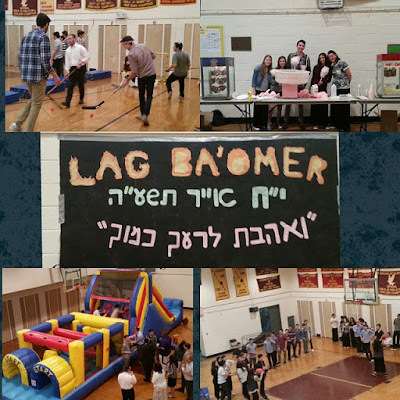 Lag Ba'omer is also the day of Rabbi Shimon bar Yochai's death and he told the Jews to celebrate his death as a happy day, and I think we can say that we did. It was an amazing event, we can't wait to see what's in store for next year!